Zach Stringham ’15, an industrial and interaction design (IID) major in the College of Visual and Performing Arts’ Department of Design, was named the Student Merit Award (SMA) winner of the Industrial Designers Society of America’s (IDSA) Northeast district during the district conference in Boston April 24-25. 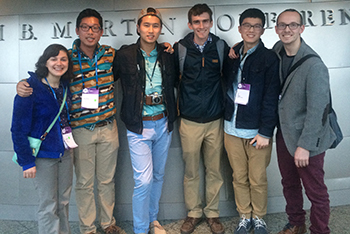 Zach Stringham, third from right, with fellow IID students at the IDSA conference at which he was named the Student Merit Award winner of the Northeast district. The SMA program provides students of industrial design with opportunities to showcase their talent and achievements at their schools, to their local professional communities and at the district and national levels. Syracuse University is one of more than 20 colleges and universities in the IDSA’s Northeast district. Stringham, who was chosen by local design professionals to represent SU in Boston, will now represent the University and the Northeast district in August at the international IDSA conference in Seattle, where he will present his work along with the four other SMA district winners. He will also be profiled in the IDSA publication INNOVATION. Stringham presented two projects in Boston: a pair of downhill mountain biking shoes that he designed as a personal project while interning at Puma, and a deep pressure therapy vest designed to help people with autism who suffer from sensory overload. The latter is his senior thesis project. Stringham’s deep pressure therapy vest, which will help people with autism who are suffering from sensory overload. Stringham’s vest is different from others currently on the market. Instead of using an inflatable air bladder with a blood pressure pump, which can be stigmatizing, bulky and cumbersome, his vest uses a cord that is tightened using cranks and cinches around the body. In the later stages of his project, he worked with Laurel Morton, an instructor of fashion design in the Department of Design, to explore how the vest could be made and to create a high-fidelity prototype. “The styling and functional components are inspired by athletic and outdoor gear,” he notes. 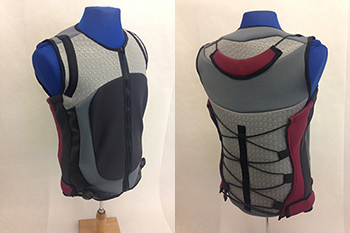 “As a result, my vest is easier to use and less stigmatizing than current solutions and looks more like a piece of athletic apparel than an assistive device. My goal is that if someone were to wear this vest in public, they would be admired rather than looked down upon. View Stringham’s projects at http://www.zachstringham.com.